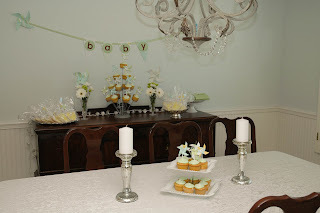 This weekend four of us, Debbie, Amber, Mom and I hosted a baby shower for my cousin, Jen, who is due a few months before I am! 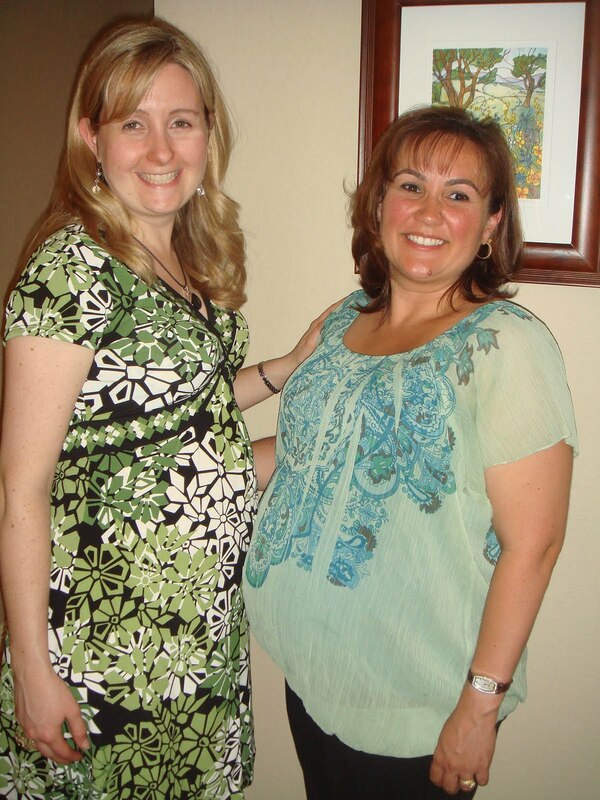 I'm so excited that we'll have cousins that will be the same age! 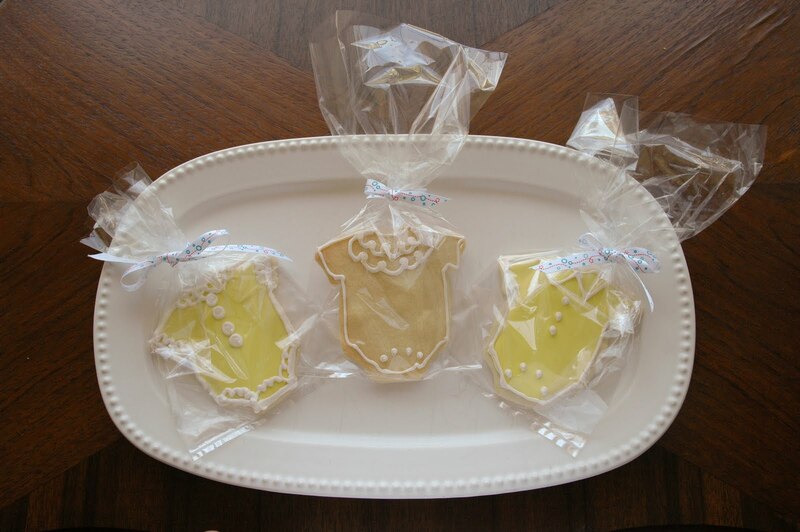 She is waiting to find out if it is a boy or a girl so we kept the colors neutral: mostly green and yellow with a bit of light blue. 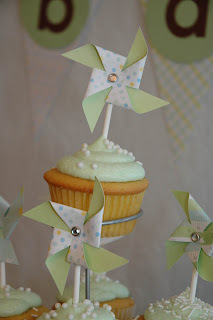 This handmade shower from the heart had a bit of a flag and pinwheel theme as well which was sweet and whimsical. We hosted about 22 ladies for a light lunch. The full menu and food will be in the next post but you can see, we created a very fresh and festive menu of salads and panini and fruit. 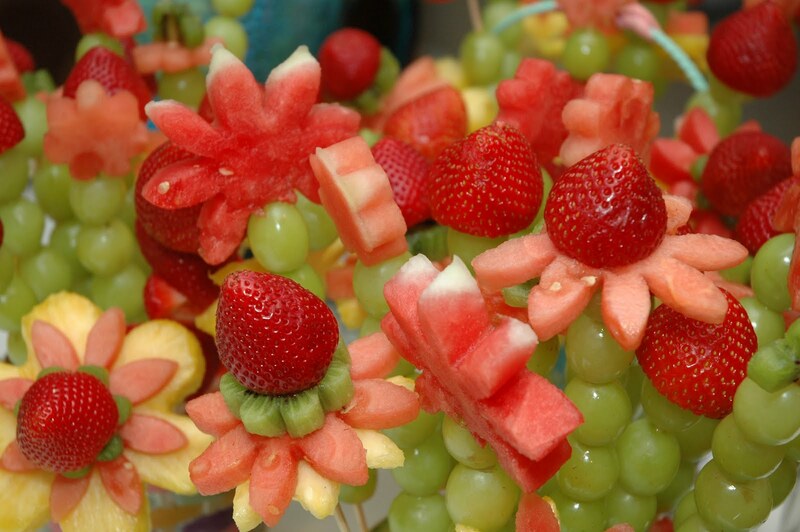 We had a lot of help from the guys preparing for the shower- special thanks to Dad for helping me carefully create the edible fruit flowers! You might remember this from a previous post. These turned out even better than the original ones! 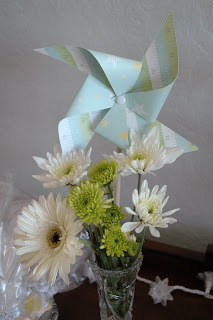 Debbie created this darling pinwheels from the same paper as the invitations (paper from Martha Stewart collection at Michaels). 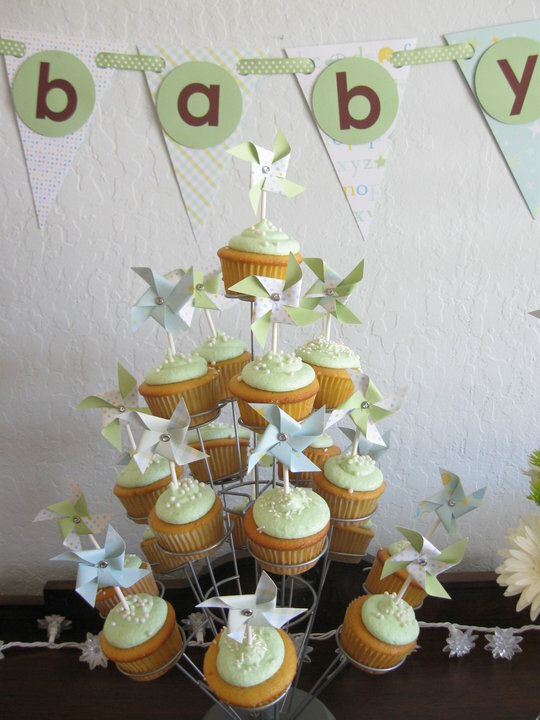 She also made these wonderful filled cupcakes and the paper banner above. 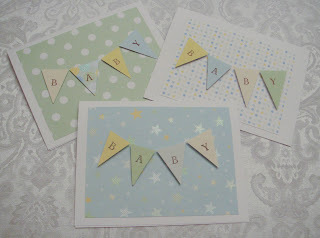 Jen took the paper banner to hang in the baby's room- what a great idea! The cupcakes were just darling and delicious and the tiny pinwheels had a sparkly center. Debbie made these by hand and glued them to a lollipop stick- a great idea. 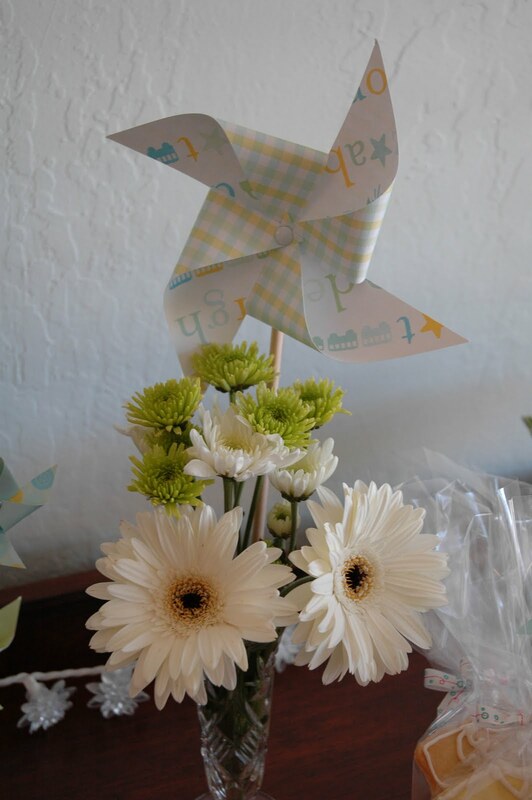 We arranged pinwheels with daisies as well. A mix of yellow, green and white daisies including Gerber were just perfect for this day. and Debbie created a "baby" CD as well. Here we are proudly showing off our baby bumps! 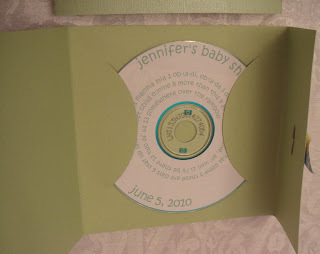 Congratulations to Jen! You did an amazing job. So incredibly professional! Puts any hosting I have ever done to utter shame. Looking cute with those baby bellies! Did you find out gender yet, Lauren? Thanks, Nicola. I can't take all the credit as it was one of those "it takes a village" events with help from my mom, my sister-in-law, my cousin's BFF, my neighbor plus Justin, my brother and my dad. What a nice party. Everything looks so light and fresh. You guys did an amazing job. Thanks, Fran...two more posts coming on the lunch menu and then on the desserts. 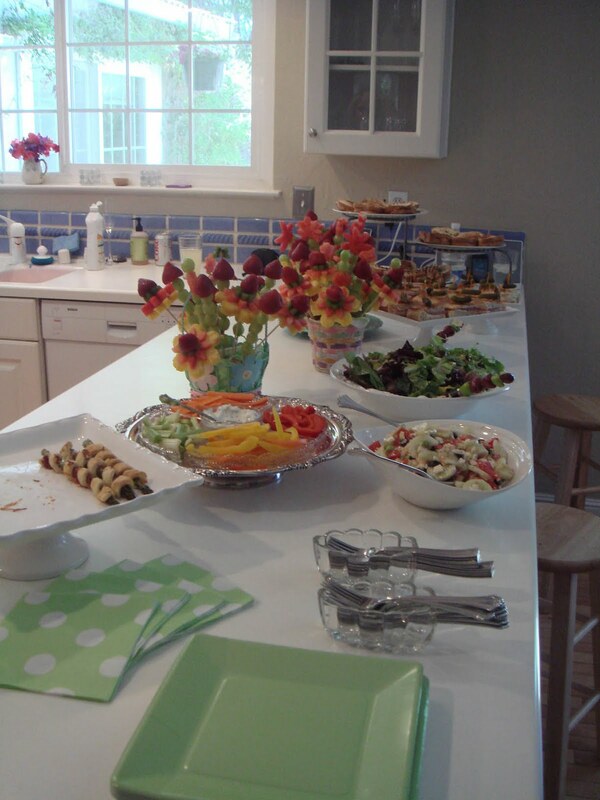 It's always interesting to me to hear what people prepare and serve at a party. We were definitely going for a fresh and lighter meal with salads and panini and fruit.